This was my second YES concert, had just seen them in Nov. 74' in Charleston, WV. Couldn't get enough of YES. I do recall Joe Walsh walking off the stage 3 times because the sound wasn't good but YES did not let me down...awesome!! This was the very first time I saw Yes live. Cleveland Municipal Stadium was huge! I sat in the upper deck with a friend. The stage had huge lighted cloud-like amorphous shapes hanging above each musician. I remember night falling, Firebird Suite beginning, the giant cloud bank of stage lights coming on and feeling transported to some other universe. It was astounding. I had heard Yes recordings, but had no idea what an other-worldly vibe they were able to create live. It was so, so cool. I especially loved Patrick Moraz, my favorite of all Yes keyboardists. Seeing Yes in the mid-seventies was really special. a very long drive from KY to see 'Yes', but it was worth it! the semi-acoustic set was very touching; actually i get emotional about it - Your Move/Mood For a Day was beautiful! and to this day - i've never seen anyone else play a classical guitar in a stadium full of people and (Howe) actually make it work! that was astounding! 'Long Distance Runaround' played acoustically was truely surprising and beautiful; and 'the *Clap*...! this time - i was close enough to see maestro Howe's fingers and i actually learned a couple of his licks from 'Clap' that day - learned how to play it right for the very first time that is!! PS - Patrick Moraz blew us away too - especially during his acoustic piano segment - classical, boogie-woogie,blues and an excerpt from the 'Refugee' album! wish i could find THAT one on CD! thank you, guys. a concert for the history books! Bob Morris remembers that the people behind us were throwing dirt clods at the back of our heads! ( probably) yelling out: 'sit down, sit down' - remember that 70's war cry at festival seating shows?? ahh.. the good old days! 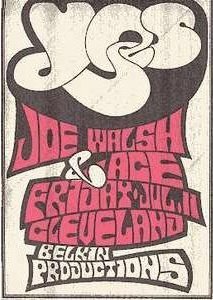 [on double-bills] Howz about this - Cleveland, 1975: local legends Michael Stanley Band, Ace, Joe Walsh, Yes. Or, translated, Choke, Gag, Wretch, Bliss. 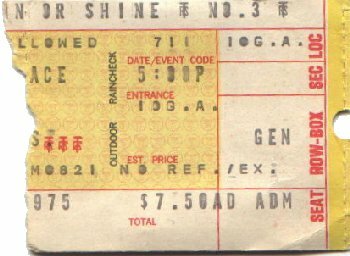 Besides the absolute splendor of Yes in their heyday, this show was notable for the 25th straight concert appearance by the guy who sleeps through the entire show only to awaken bellowing out his (long departed) girlfriend's name. Anybody seen him lately?